For a unique Hanukkah menorah this aquarium designed hanukkia has a Jerusalem relief motif on the base & lid and the place for the candles has been enclosed in glass. This lovely Israeli made Judaica comes to you from the Paldinox Novell Collection. You can place your hanukkia outside your window or at the entrance to your home this Hanukkah holiday with this special aquarium type Hanukah menorah from the Paldinox Novell Collection. 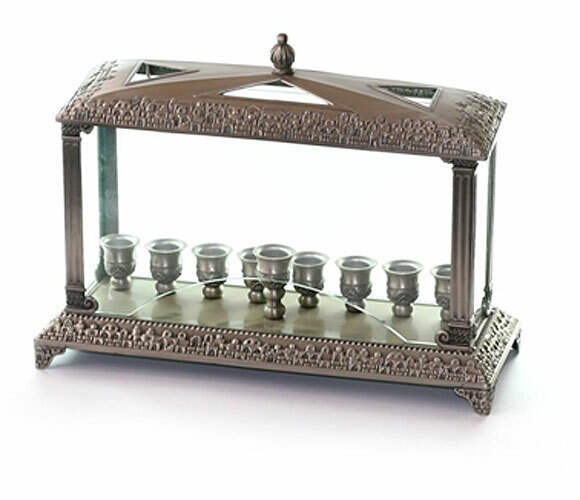 This menorah is made in Israel and is designed in either silver plate or pewter and glass to compliment your Judaica collection. The metal here has been embossed with an abstract design to depict the ancient skyline of Jerusalem. This pattern appears along the bottom edges, along the top of the glassed in area and ending at the top in pyramid fashion, with four triangular openings to let the air and light come out. Up the four sides of the fish tank where the candles are placed is more silverplate/pewter, fashioned to look like Greek columns, to finish off the classic look. Finally, there are four panels of glass, one of which opens to allow you to place and light your candles inside. 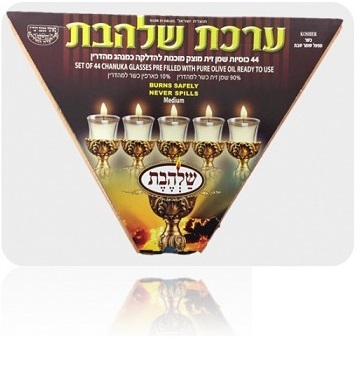 The candle holders inside are aligned with the eight holders for each of the days of the Jewish holiday in one line, with the shamash on a separate line and slightly higher than the rest of the holders. 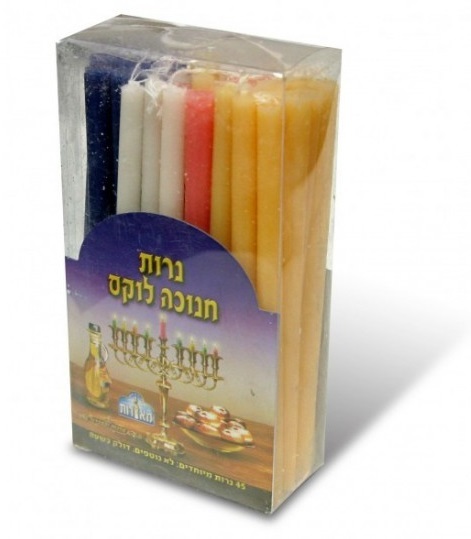 The whole menorah is 35cm wide, 28cm high and 4cm deep, making it just the right size to put on your window sill. This would make an appreciated gift for anyone who is looking for something just a little different this Hanukkah holiday.